Gendio, formerly known as Griffith Elder , specialise in the manufacture, supply, installation and service of fixed and mobile weighbridges and weighing solutions. Gendio use the latest technologies and highest quality materials to develop their range of mobile weighbridges and weighing solutions for the agriculture, mining, logging, gardening supply, landfill and recycling sectors. 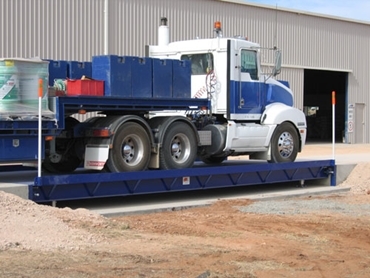 A highlight of Gendio’s range is the use of fully steel constructed weighbridge platforms to provide easier, faster construction and the ability to construct a weighbridge in areas where it has traditionally been difficult to pour a concrete slab, such as bushland, forest and remote farming or mining areas. The fully steel constructed weighbridge platform range also includes a new Combination 2 in 1 platform, which offers two systems in one, featuring additional load cells that allow weighing of an entire load, plus axle-weighing capabilities. a range of accessory options including the latest printers and electronic displays. Gendio Managing Director, Peter Hallam, said customers can continue to expect the use of top-quality materials and the most recent technologies from the newly-renamed company. “Griffith Elder has been providing Australian companies with weighbridges and weighing solutions since 1992, and as Gendio, we will continue to offer customers the top-quality products and services, which use the latest technologies and quality materials available, that our customers have come to know and expect,” says Hallam. “Our new website will now make it even easier for our customers to access information about the special features of Gendio’s weighbridges and weighing solutions and find the products and services that meet their specific needs. In particular, they can learn about the benefits of our fully steel constructed weighbridge platforms which are longer lasting, more reliable and faster to install,” he concludes.